A dog always smells his food before he eats it. When you put your dog's dinner dish down, you might think his most important sense is taste, but a dog's strongest sense is actually smell -- scent attracts him to food. A dog can usually tell you if a batch of dog food is bad without tasting it; his sense of smell kicks in and he'll refuse it. His nose also tells him if you've put medicine in his food that he'd rather not take. Dogs have a super-sized sense of smell compared to humans, whose taste buds are much more developed than a dog's. Dogs have 1,700 taste buds compared to 9,000 in humans, or one taste bud for every six human ones. A dog's taste buds are concentrated around the tip of his tongue, so once the food is in his mouth, taste matters very little to him. You dog's sense of smell tells him more about what he's eating than his taste buds. A dog's taste is limited to several specific things: sweet, sour, bitter and salty. He doesn't taste the nuances of food as humans do. This may explain a dog's indiscriminate palate that includes items you would find completely unappealing. When he smells something that catches his interest, it's easy to assume it's edible. For instance, a piece of plastic that may have the flavor of food seems like a tasty treat to him, even though it could land him at the vet's office if he eats it. Since dogs are omnivores who primarily eat meat, their sense of taste is keyed to meat flavors. Omnivores eat both meat and plants, so if you offer a dog some green beans, the odds are he'll eat those, too, but not with as much relish as a piece of steak. When it comes to smell, dogs have it all over humans. Dogs have an estimated 125 million sensory cells in their noses depending on the breed, as opposed to 5 to 10 million for humans. This equates to thousands of times more scent than the human nose can detect. So when you watch a dog run through the grass nose to ground, those sensory cells are collecting a vast amount of information, since estimates suggest that one-third of a dog's brain is dedicated to his olfactory senses, or his mental library of scents. It's this sense of smell that makes canines such valuable and effective partners in drug detection, search and rescue work, even in detecting some human medical conditions such as epileptic seizures before they occur. As your dog ages, so does his sense of smell. This can account for declining appetite in some older dogs, who are no longer able to smell food as well as they could when they were younger. You may find that a different food appeals to your aging dog because it has a stronger smell than what he's been eating. His sense of taste declines slightly too as he ages, but it's the sense of smell that sparks his interest and dictates what he wants to eat. 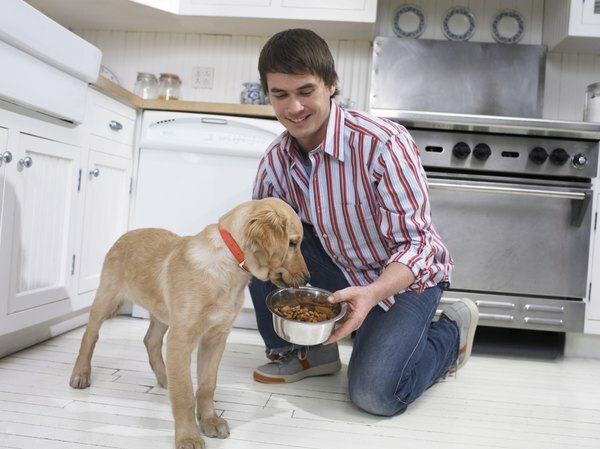 Psychology Today: How Good Is Your Dog's Sense of Taste?